In an effort to celebrate Hispanic authors beyond National Hispanic Heritage month, I plan to read and post about YA novels written by Latino/as. You may also want to check out Latina Book Club, a site by Maria Ferrer dedicated to promoting Hispanic authors and literacy. And, today’s YA author in the spotlight is: Nancy Osa. Enjoy! AUTHOR: (information comes from the author’s website http://www.nancyosa.com): Nancy Osa was born in Chicago, grew up in South Holland, Ill., and now lives in Portland, Oregon. Her father is from Cuba, and her mother’s side of the family traces back to the Mayflower. Her first novel, written as her BA thesis, remains unpublished. Her debut novel, CUBA 15, earned the following awards/honors: Pura Belpré Honor Book, ALA Notable Book for Children, YALSA Best Book for Young Adults, An Americas Award Honor Book, a Booklist Top Ten First Novel for Youth, A Children’s Book Sense 76 Pick, A New York Public Library Book for the Teen Age, Delacorte Press Prize for a First Young Adult Novel. MY TWO CENTS: I have read a lot about, and even written an article or two, about the Hispanic Sweet 15 party, so I was familiar with the subject going into this book. Osa does a great job of presenting all that goes into this important ceremony and representing Violet’s mixed heritage: Cuban, Polish, and American. All of the characters are distinct, and well-developed with the right mix of seriousness and humor. Violet is a members of the debate team, which is cool and something I had never seen before with a Latina protagonist. I often read books by Hispanic authors about the harsh realities of living in poverty. I have to say, reading CUBA 15 was a refreshing change. 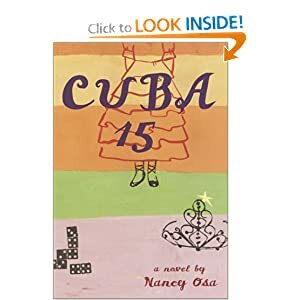 Find CUBA 15 on Amazon.com and Goodreads.